In this work, a novel ternary magnetic nanocomposite namely Ag/CuFe2O4/rGO was produced by a facile solvothermal route. 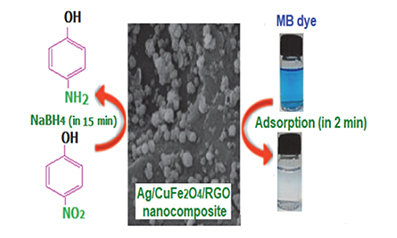 The reduction of graphene oxide (GO) to reduced form (rGO) and the in-situ deposition of CuFe2O4 and Ag nanoparticles on rGO occurred simultaneously in a one-pot reaction. The structure, composition and morphology of the as-prepared nanocomposite were characterized by FT-IR, XRD, VSM, FESEM, EDX, TEM, and BET analyses. The results indicated that the Ag and CuFe2O4 nanoparticles were successfully loaded on the surface of rGO. The catalytic performance of the Ag/CuFe2O4/rGO nanocomposite was evaluated for the reduction of nitroarenes to corresponding amines in the presence of sodium borohydride (NaBH4) as a reducing agent. The nanocomposite exhibited the high performance in the reduction of the reduction of nitroarenes with 100% conversion within 10–30 min. The catalytic activity of the Ag/CuFe2O4/rGO was enhanced compared with Ag/CuFe2O4, Ag/rGO and CuFe2O4/rGO samples due to easier electron transfer process. Furthermore, the adsorption data revealed that cationic methylene blue (MB) dye could be removed almost completely on the Ag/CuFe2O4/rGO composite within 2 min and the composite could also selectively adsorb MB from the mixed solution with anionic methyl orange (MO). Due to the existence of magnetic CuFe2O4 nanoparticles, the Ag/CuFe2O4/rGO nanocomposite can be magnetically separated and reused without any change in structure and performance.